I have always enjoyed the English propensity for a Sunday roast. I've made my way back up to the wintery North for the first time in a long while and remembered a meal I made and photographed before I left, that came about mostly because I was enamored with how pretty figs look. 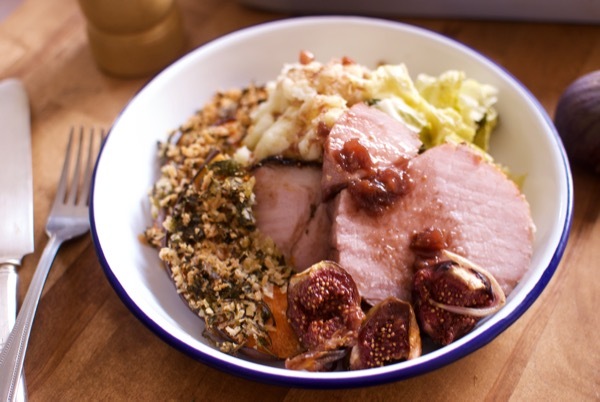 Instead of doing a traditional roast with gravy, I decided instead to roast a ham joint with the figs and then create a sauce from the fig drippings. 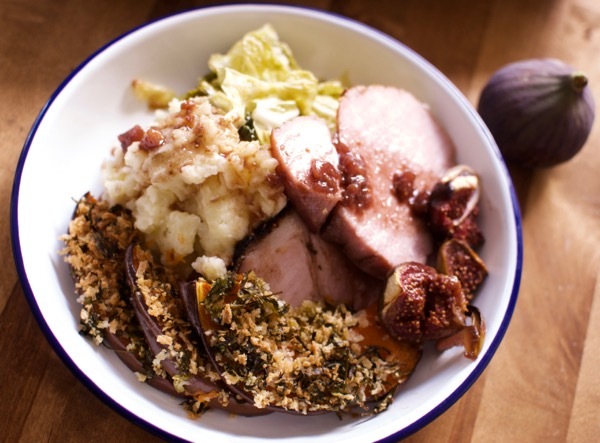 The roast itself was very simple, sliced onion for depth of flavor, quartered figs and the ham joint, well salted. I used the juices in the pan to glaze the ham while it roasted, and then strained it into a sauce pan while the roast rested and reduced it by a third. I added honey, vinegar and red wine to the sauce for a little more complexity and added some figs to stew so that its figgy flavor deepened. Glazing the ham with the fig juiced created a beautifully, caramelized crust on the top and the sauce was sweet without being too sweet and tangy and deeply flavorful. 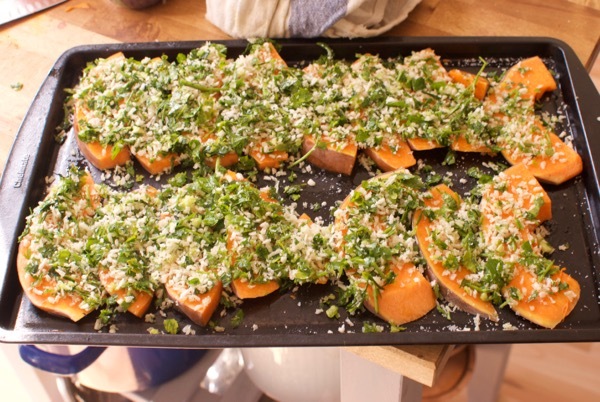 I served this with mashed potatoes, sautéed cabbage, and my favorite crusted pumpkin. It was heaven. On another note, figs are very pretty. Don't you agree? Pre-heat the oven to 185C. 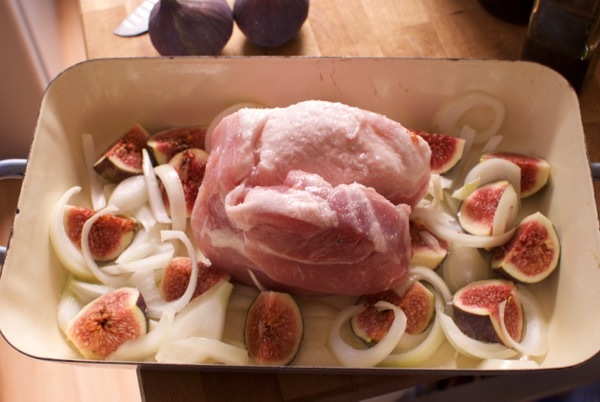 Place most of the fig quarters, (saving one to add to the sauce) and the onions in a roasting pan. Toss with salt and pepper. Rinse and pat the ham dry. 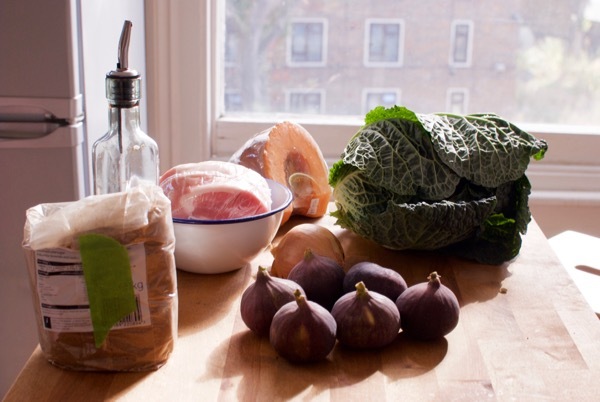 Sprinkle liberally with salt as well and nestle it among the figs and onions. Roast for 30 mins per pound. Every 10-15 minutes spoon some of the juices over the top of the ham. 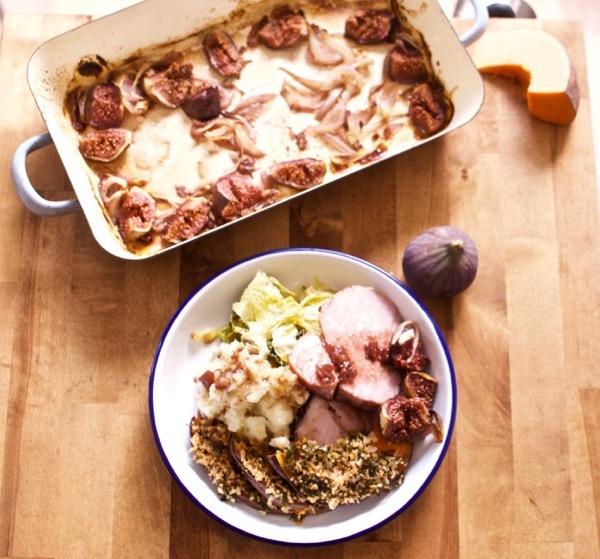 When the ham is cooked through, remove from the oven and place on a plate. Strain the juices from the pan through a sieve into a sauce pan. Add the wine, honey, vinegar and chopped figs. Bring to a simmer and stir every few minutes. You want the liquid to reduce and thicken. When the liquid is think enough to coat the back of a spoon, it's ready. Serve with all manner of sides.